thanks for stopping by ..
but too long a story for now .. 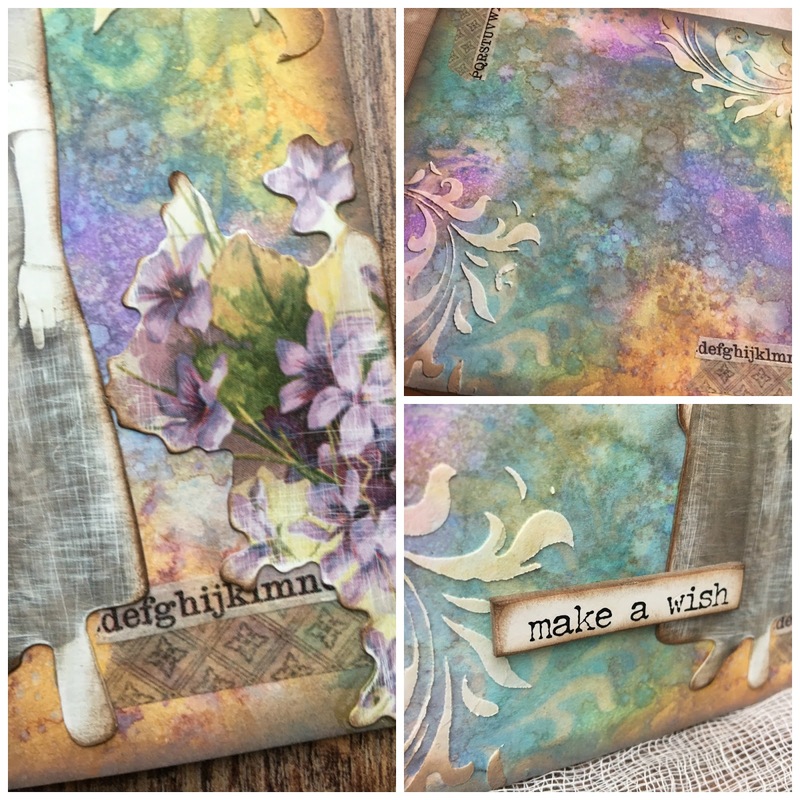 So here is my make ..full of some of the yummy new goodies from Tim Holtz . Country View Crafts here . I am still so in love with the new distress oxides and enjoying my playtime with them and eagerly awaiting news to see if more colours will be coming...I do hope so! 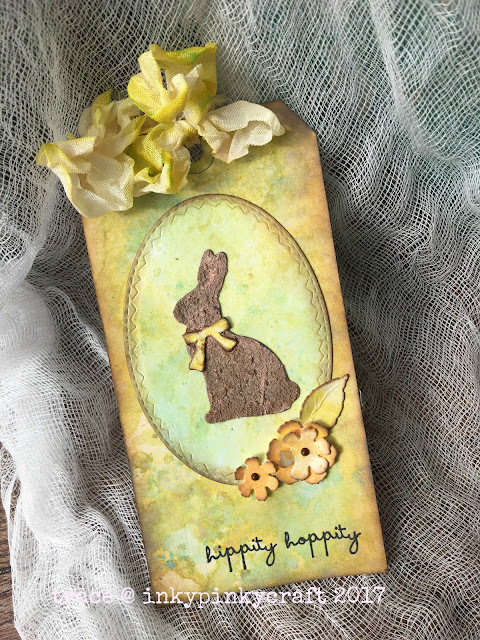 So for the background on this tag I used iced spruce and vintage photo..
For the background of the tag I applied these straight to the tag and spritzed and layered ... 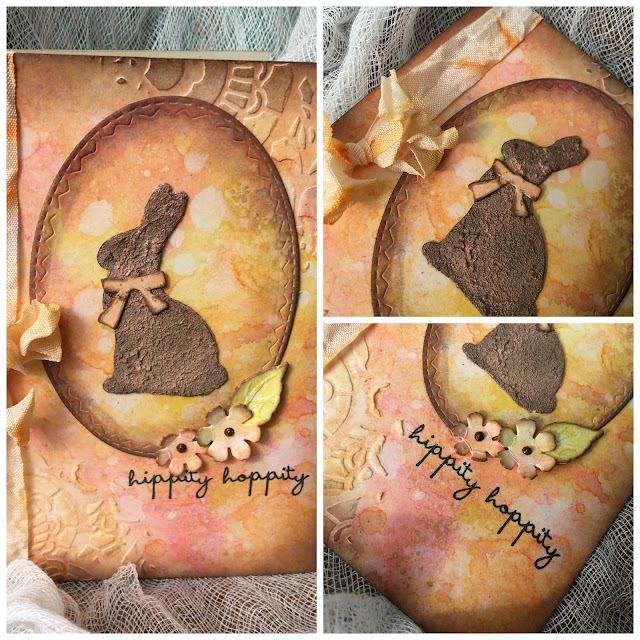 I also created another piece , to use to die cut from using walnut stain distress oxide and distress ink and iced spruce distress oxide , applied to craft sheet , spritzed and dipped into.. 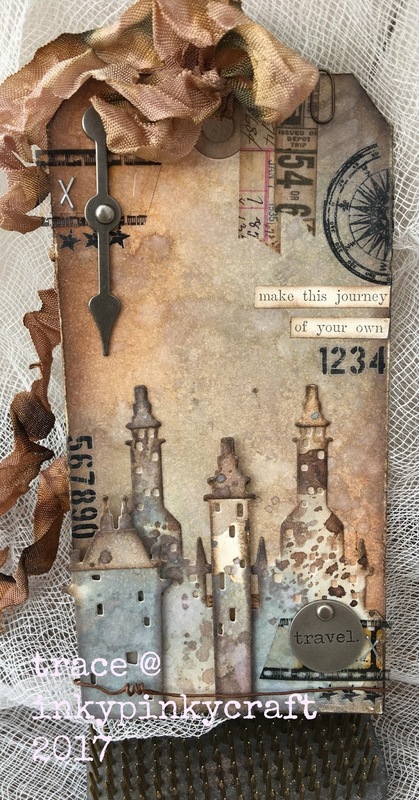 I due cut the houses using metropolis thinlits from Tim Holtz...using the pre-prepared piece of card and inked edges using ground espresso distress ink. Now for the details...I added these onto the base layering some on 3-d foam to create depth ...a clippings sticker, cut and edged with ink, some dyed seam binding, rub ons and plenty of my much loved idea-ology.. 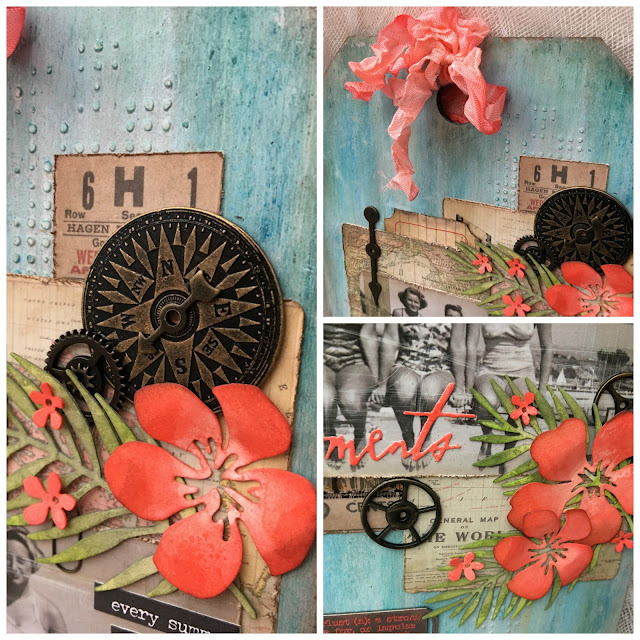 I cant get enough of the film strip and mini attacher staples.. for that added detail..
and here are the fab die cuts with all those inky splatters..and a bit of rusty wire .. 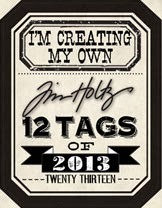 So hope you like my make , a simple playtime tag full of Tim Holtz yumminess! So I am off for some more GCSE maths lessons to sort ,, among other things ..
whatever your day brings hope its a good one .. 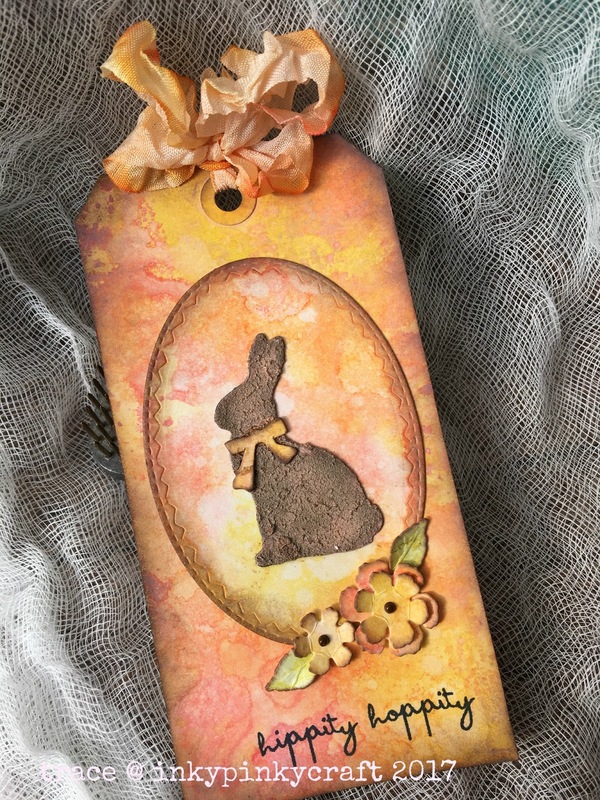 So here I am today with a sneaky peak of my post over at Country View Crafts, using lots of distress oxides and yummy Tim holtz goodies..
all the details of how I made these can be found here .. Here are a few close ups of the details of the orange card..all details over at Country View Crafts here..
and the green toned one .. So it has been a while but here is a tag I created using one of my vintage photos, texture paste and also plenty of distress crayons. 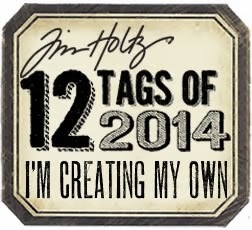 I then selected some collage elements to use on the tag. I inked the edges and also selected some idea-ology and a die cut heart that I inked and spritzed. I placed them onto the tag to decide where to place them and added some collage medium and then some distress crayons.. 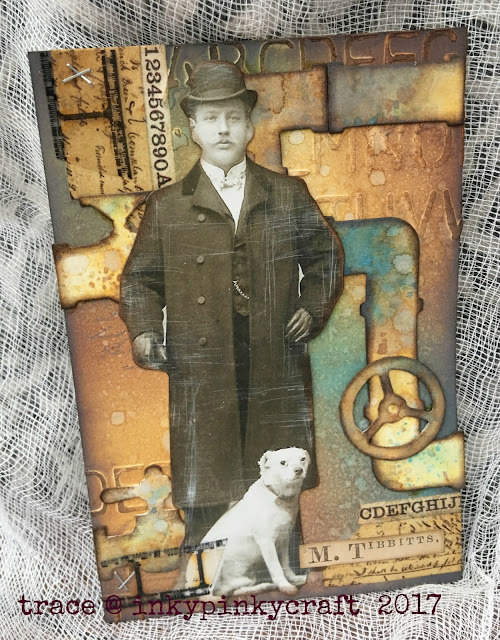 So there is my make ... a vintage coloured tag inspired by a vintage photo.. I would like to add this over at a Vintage Journey - where they are offering that you can add a tag for tag Friday. 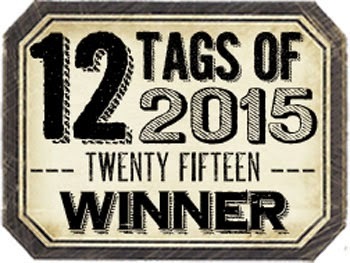 I would also like to add it to Go Tag Thursday - where the theme is vintage. Well when Mandy asked if I would like to be a host over at Sunday Postcard Art - I was shocked as I hadn't blogged for an age but decide it might just be the push I needed to get me finding some stolen moments of inky...so I said yes, then panicked , wondering why I had said yes...but decided ...I must try to find some inky moments - however far between they are.. 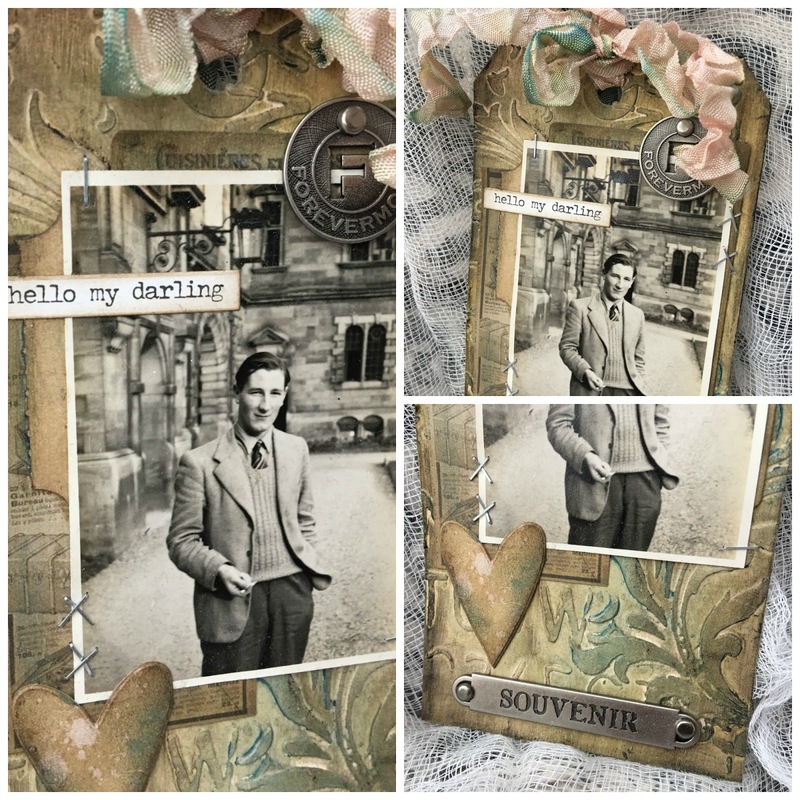 So here goes ....my first ever postcard - the theme is Vintage Gents...and all the details of how to play along can be found here... so why not hop across and join in the fun.. 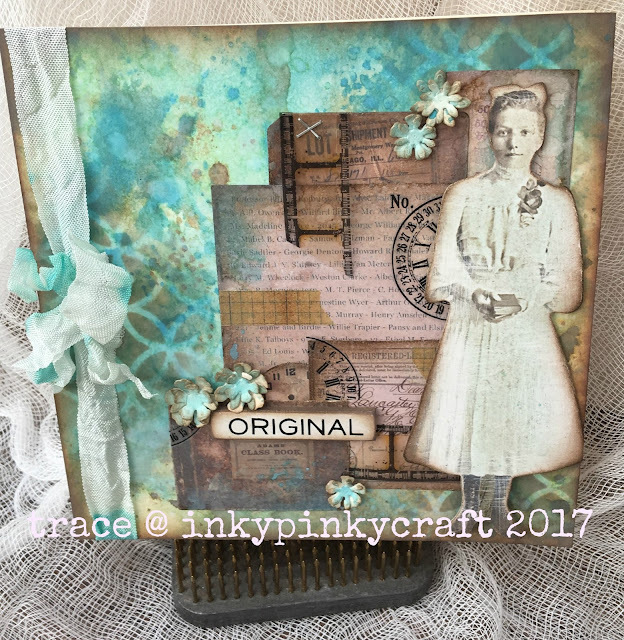 So I started by adding some texture paste through a Tim stencil and creating a background using distress oxides...so loving these! 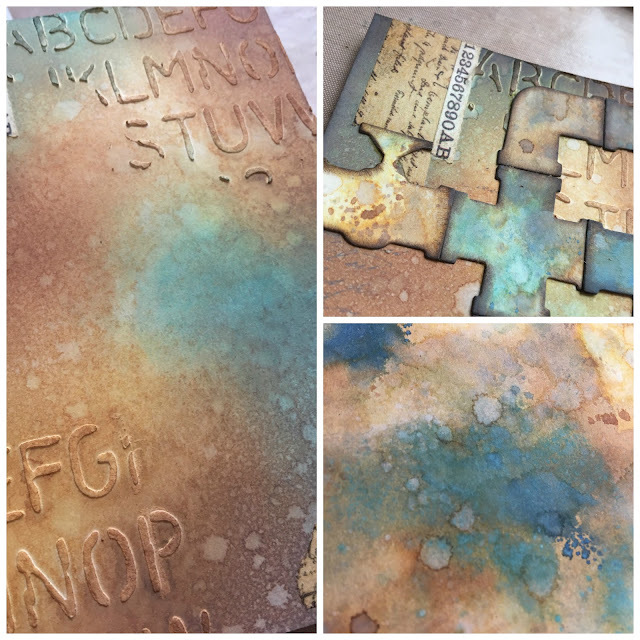 I first layered brown ink ( distress oxide ) onto the card itself, then added other colours on top - the real joy of the oxides is being able to layer colours and still see those colours even over darker ones .. lots of water to create the magic.. I knew I wanted to add one of the new paper dolls! 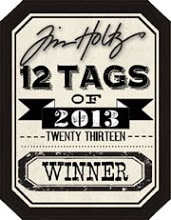 - so loving these so expect a few more posts with these ... there are 107 in one pack! 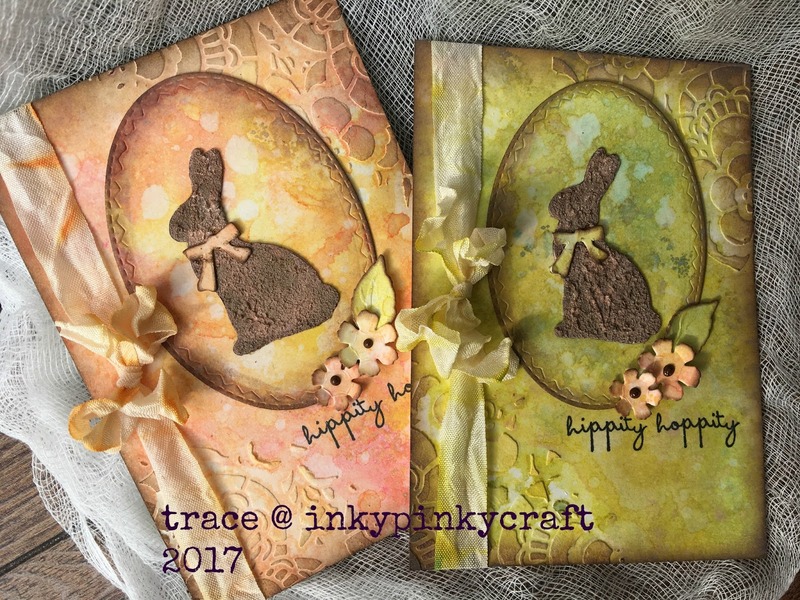 I pressed some distress oxide colours onto the crafts sheet and misted with water, to create inky droplets..then swiped the card through, dried and then dipped in again , drying between each layer to stop muddy colours..
.then spritzed card with water and dried to let the magic of the oxides happen.. 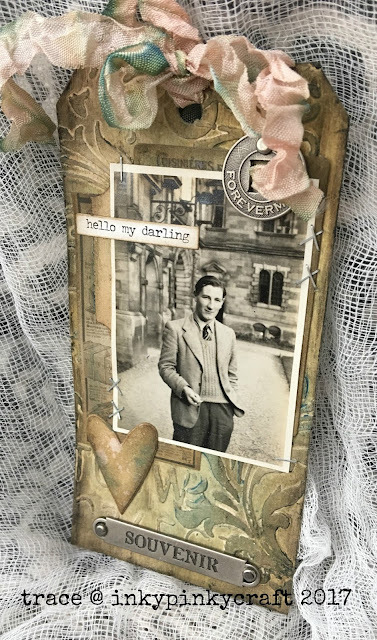 I then added some of the new aristocrat tape to the postcard - which measures 6 x 4 inches and placed on the pipes and played around till happy then glued into place .. I love these pipes and know they are going to be firm favourite of mine! Now for the gent himself, I sanded the edges and the image a little as I like the feel it gives ...and added a little ink around the edges.. So if you fancy joining in the fun, I cant wait to see your entries... on my chosen theme Vintage Gents ...hop across here and Mandy has all the details ! Thanks Mandy for asking me . Well it is my turn over at Country View Crafts again here with the results of some stolen moments of playtime...using distress oxides and my new paper dolls!! all the details of how I created this can be found over at Country View Crafts here. i am so in love with these inks!! 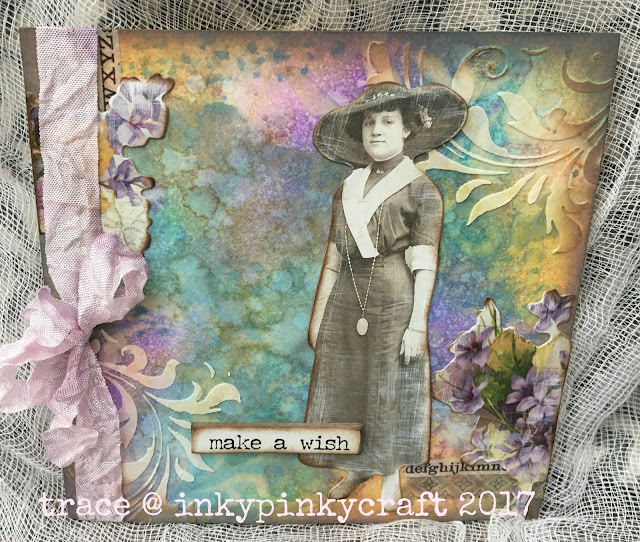 and look forward to playing soon with lots more ...my previous card created with them can be found here . 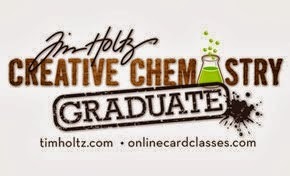 Well like lots of others I have been eagerly waiting to get my inky paws on the new distress oxides from the one and only crafty master , Tim Holtz. So have been playing with some backgrounds (which I will share later ) - and now here is a finished piece . 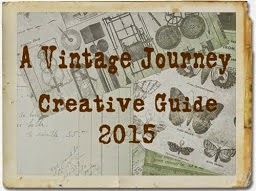 So all the details of how I created this can be found over at Country View Crafts here . 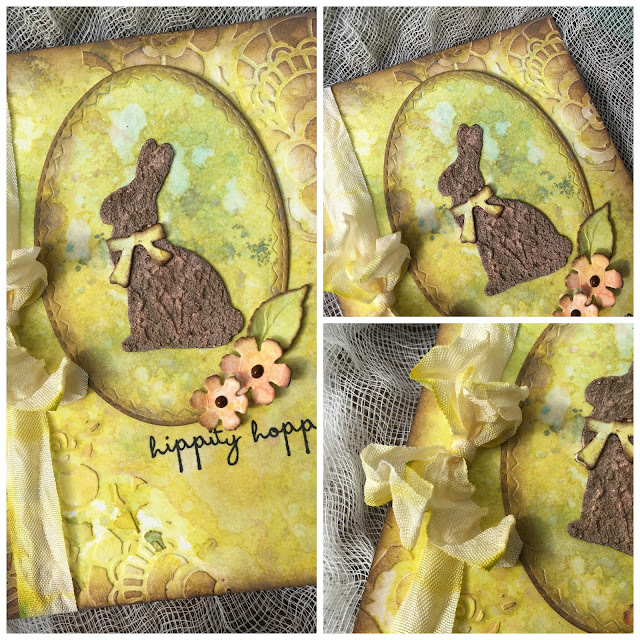 Well how proud do I feel to be guest designer for the new challenge over at Frilly and Funkie! 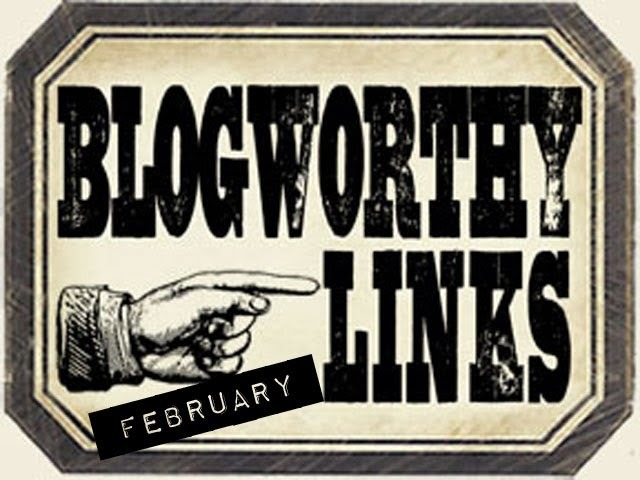 I haven't blogged for such a long time, so be given the opportunity to guest design having won with my first post in nearly six months was a huge honor...just hope I'm not too rusty! So the theme is out of the cold...and all the details as well as gorgeous inspiration can be found here . I started by giving the base a coat of distress paint in tumbled glass and smudged on some picket fence with my finger. I added some texture paste through dot fade stencil to add some texture, left to dry and coated with a layer of collage medium . Next I added some lines of distress crayon and smudged in with my finger, gradually and slowly smudging and building up the colour until I was happy - I know I am late to the party on these but I am loving them ! 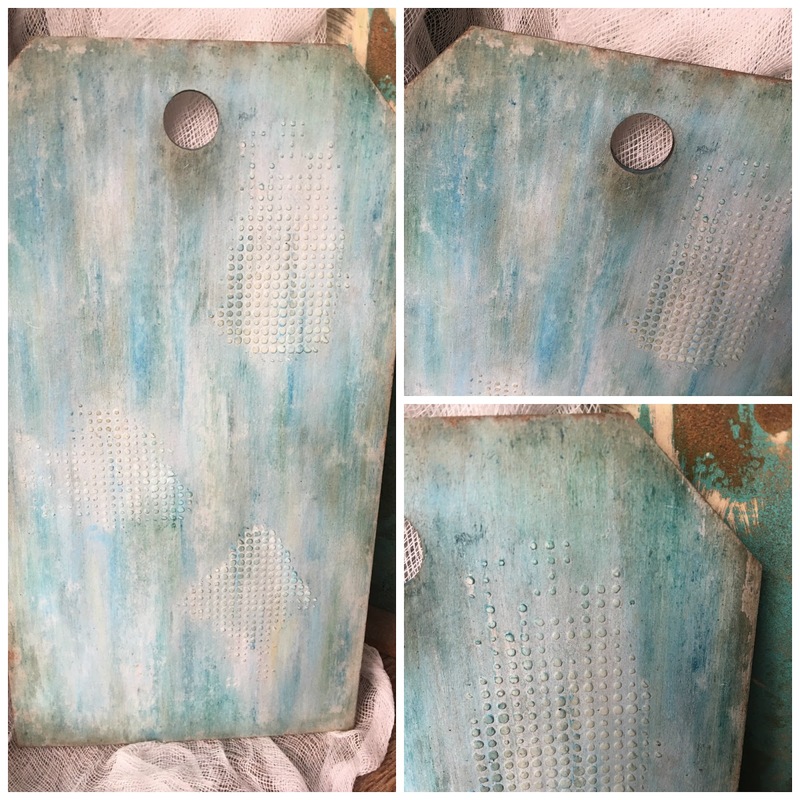 I then lightly sanded back some areas of the edges ...to give a more vintage feel and added in some walnut distress crayon...well there was bound to be brown in there somewhere! this show the texture and colours- was kind of hard to cover some areas up. I then started to add the base layer of collage elements ...slowly building as I went... I had used the other tag to lay out my pieces to get an idea of placement..as that helps me to plan the overall layout. So now for the details...I wanted a splash of tropical colour and what better than shades of abandoned coral flowers and hand dyes seam binding...I used the Tim Holtz tropical dyes and distress spray stain to colour the foliage and flowers and then added walnut stain distress ink to highlight the edges. 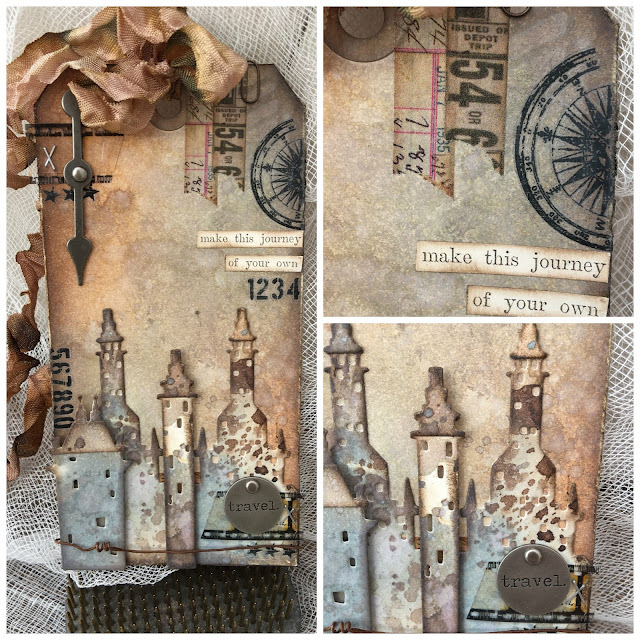 The foliage was dipped into spare stain from the craft sheet to create a more natural mottled look..and a compass idea-ology piece to tie in the while travel / holiday feel. I love the found relatives and am eager to get my inky fingers on the new paper dolls....so this found relative card formed the focal point ...plenty more splashes of colour...very unusual for me.. 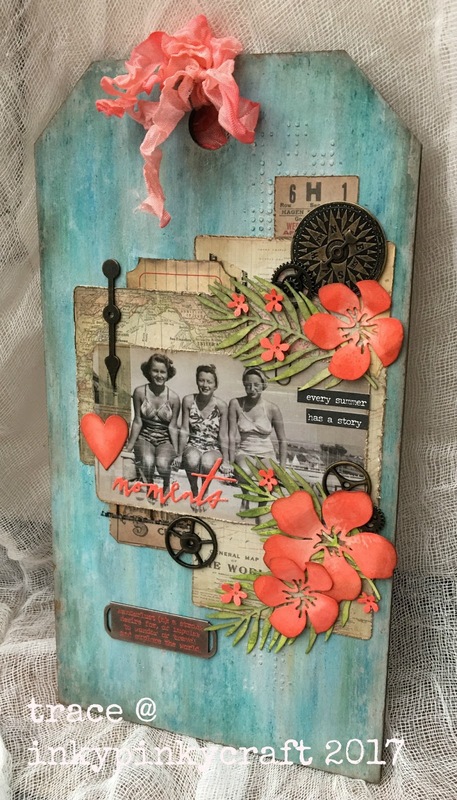 The top was finished with a splash of hand dyed seam binding and an idea-ology plaque- wanderlust was coloured using distress crayon..to complete the piece. So all that remains is to say a huge thanks to all the lovely ladies for having me as guest designer...and leave you with a final photo of the finished piece .